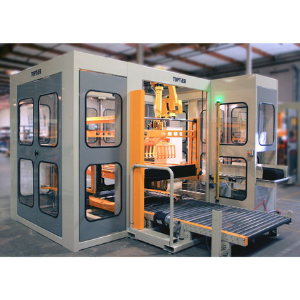 The ROBOPAC brand is the world leader in the design, production, integration and service of secondary packaging solutions. Through our partnerships with OCME & TopTier Palletizers we are able to offer a full line of configurable machinery to pack, palletize, and stretch wrap essentially any product in the food & beverage, personal care, pet food, pharmaceutical, dairy, automotive and industrial industries. 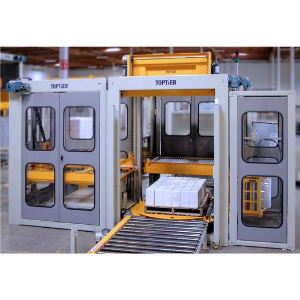 TopTier, offering mission-critical components of automated end of-line packaging operations aligns with our values of innovation as the world leader in the palletizing industry with newly patented technologies that offer concurrent stretch wrapping and “positive product handling” which confirms proper load construction prior to layer deposit. Being a true example of reliability & commitment to the customer through service, TopTier leads in industry safety standards with all machines being built to a minimum of Category 3. Work with existing floor-level conveyors. Advanced capabilities & performance w/o robot programming. Palletizer model groups share common functional modules and frame systems to provide comprehensive palletizer solutions. Shared modules maximize layout flexibility while reducing cost through increased manufacturing and machine controls efficiencies. Modular engineering means quality control and complete flexibility in the configuration of machine components. No customization is required. The orientation of induction and load exit meet your exact requirements. Additional modules information. TopTier palletizers combine the most recent advances in machine control technology with an intuitive interface HMI and EasyStack® pattern programming software. Additional controls information. Safety has been integrated into every aspect of palletizer design to meet all industry standards utilizing a category 3 safety cage frame design with light curtain protection of load exit, redundant hoist fall protection, and controlled door entrance protocols.